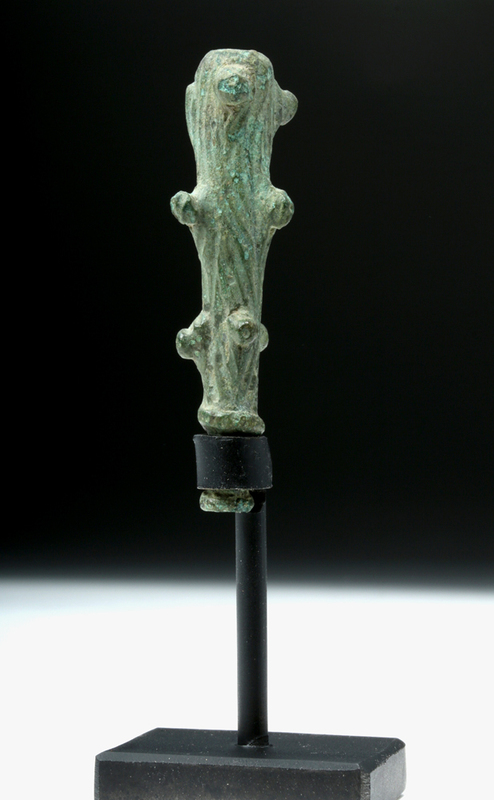 We all know that the pagan Scandinavians wore little Thor’s hammer amulets, but until I wrote my post on Hercules, I didn’t know that Roman soldiers wore similiar amulets in the shape of the god’s club. They spread this practice across the Empire with them, and this may be the origin of the Donar’s Clubs that turn up in graves from the 4th century onward. Unlike the others, the Gauls never seem to have worn their god’s hammer or mallet as a symbol, which may be because his was never a weapon, but a tool of his craft. They did, however, cut the hammer symbol into altars to their god, or dedicated little votive hammers at his shrines. Statue of Sucellos from the Musee National d’Archeology. Wikimedia. In Gaul, the hammer-god (since he’s either known as Silvanus or not named) frequently appears at healing shrines. At Glanum there were about 100 altars, without any inscriptions, but with the hammer incised into them. The few inscriptions found there were to Silvanus, so he may be hiding our god. Another shrine, at Nimes, also features images of the god with his hammer and patera, an offering-dish. In one, a dog crouches at his feet. Several more hammer-altars, probably from poorer suppliants who couldn’t afford a dedication or statue, were found there, as well as at the shrine at Vaison. It’s in Eastern Gaul and the Rhineland that Sucellos comes into his own. An altar at Sarrebourg had an inscription, to Sucellos and Nantosuelta, and images of the god and his consort. Several other images of him with his long-handled hammer and other attributes suggest that the Gaulish hammer-god must be a very similar deity. It’s interesting one image has a nail tucked into the belt of his tunic, perhaps solving the mystery of what his hammer or mallet is for. This is one of the mysteries surrounding this god: is he a god of coopers (they use mallets, and sometimes he has a barrel), masons, fence-makers, or possibly butchers? It’s not even clear if the long handle on his mallet/hammer is functional or if the artist used it as a support for his statue. While his name, the Good Striker, suggests a warrior, it could equally apply to a god of a craft. Hercules and the Hydra by Antonio del Pollaiolo – Google Art Project. If we’re uncertain about why Sucellos had a hammer, with Hercules we’re in no doubt.1 The Graeco-Roman Hercules was another working-man’s god, who used his strength (and some basic cunning) to overcome various monstrous foes. Although he used a number of weapons in his myths, artists usually showed him with his club, a very basic weapon that expressed Hercules’ rough-hewn nature. Roman era Hercules’s Clubs appear from the 2nd to 3rd century, spread over the empire (including Roman Britain, c.f. Cool 1986), mostly made of gold, shaped like wooden clubs. A specimen found in Köln-Nippes bears the inscription “DEO HER[culi]”, confirming the association with Hercules. The Hercules club amulets could be quite elaborate, made of silver as well as gold. Others are more workmanlike, like the original tree branch that Hercules laid about him with. (And, among the finds in the Thetford treasure were women’s versions, stylized Hercules’ clubs in the form of either earrings or ankle pendants. Similar earrings were common throughout the empire, as well as the clubs.) The amulets were popular with the Roman army, so perhaps their wives wanted to wear them too. Willingham Fen mace, from different angles. Roman design with Celtic animal heads. Wikimedia. By the time of the late Roman Empire and its fall, the club amulet had spread into Germanic territory, where it became very popular. They have been found all the way from the Ukraine to England, dating from the 4th to the 10th century CE. This may be because of Germanic auxiliaries who served in the Roman army and, through interpretatio Romana (or Germanica) saw Hercules as a form of Donar or Thor. The Alemanni, for example, who lived in the Upper Rhine region, were one tribe who adopted these amulets, but others made from deer bones have been found buried with people from Merovingian territory. Thor’s Fight with the Giants by Mårten Eskil Winge, 1872. Google Art Project. The thunder-god’s hammer had always been significant; it features in two different myths, one which tells how the gods got some of their treasures, and another one about how the giants stole Thor’s hammer and held it to ransom. The hammer was an instrument of consecration: it hallowed weddings and births, as well as sacrifices. Thor was a popular god, especially with farmers and landowners, and his role as protector against the giants and other menaces meant his hammer, Mjolnir, was a focus in a way that Odin’s spear and Freyr’s sword weren’t. The earliest find of a Thor’s hammer was in Kent, in England. It came from a 6th century Jutish grave. The site where I found this argues that this refutes the anti-Christian thesis, but there’s no reason why the hammer couldn’t have taken on other meanings as time went on and Christians began encroaching on pagan territory and culture. An amulet, “silver strongly gilt”, representing the hammer of Thor. Found in 1877 in Skåne, Sweden. Wikimedia. Of the three, then, Thor’s hammer has had the most staying power. This may be in part because of its use as an “anti-cross” by diehard pagans, which probably boosts its appeal to heathen and anti-establishment types. But I like to think that in some Neil Gaiman-esque realm somewhere, Sucellos is calmly standing with his long mallet, while Thor is inwardly writhing over Mjollnir’s short handle, the only flaw in his weapon. Simek, Rudolf 1996: Dictionary of Northern Mythology, D.S. Brewer. It makes him more relatable, for sure. He was much more popular than a lot of people give him credit for, and I think that his funny side was part of that. I like to think he could take a joke. The overlaying of god names in the ancient world often causes confusion for modern interpreters looking back, but concentrating on a common symbol or image, as here, is an enlightening way to see through that confusion. Thanks – the hammer/club amulets intrigued me. I didn’t expect to get that continuity of use, but it makes sense because people tend to want the same things from their gods. Excellent article. There are interesting aspects to both Taran(us) and Sucellos, similarities. I am researching this topic and how Dagda fits into the paradigm. I know Dagda does and I know there was communication and cultural connections. Some linguistic clues out there. Keep up the good work. Thanks! I do feel that the Dagda and Sucellos have a lot in common. Taranis probably does too – it would be nice to know more about him. Enjoyed the article, very good points in it. A question; the Alemannai used, or adopted, the ‘club’ amulet… if I read that right. Is it possible to see a source on that fact? Doing some research for a new book of mine, that piece of data fascinating. I would like to use that data to make a connection in my narrative. Many thanks, agus go raibh maith agat mo chara. I got it from the Wikipedia article on Mjolnir, and their reference is Werner: “Herkuleskeule und Donar-Amulett”. in: Jahrbuch des Römisch-Germanischen Zentralmuseums Mainz, Nr. 11, Mainz, 1966.